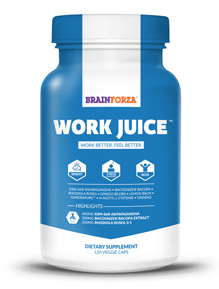 Work Juice is quite an interesting product because not only can it enhance improve memory, but it also aims to reduce stress and enhance mood. Based on these claims alone, we can tell right off the bat that their approach as a brain supplement company is completely on track. By decreasing stress levels, our brain becomes better-adjusted and ready to focus for longer periods of time. The company explains their product as one that can help you overcome stress and mood battles at work, which would in turn provide higher productivity and a better brain function. They come up with a lot of products in attempt to increase sales and income. They specialize in immune systems and brain functions so they create products that fall under one of the two categories. We honestly believe that the latter is most likely the case, since the company abstains from deceptive marketing techniques and seem to be quite reliable. As mentioned above, we have not seen any skeptical advertisements related to the brand. The product is available for purchase on Amazon.com, which means that costumers are able to write about their opinions and experiences with Work Juice. At first glance, the list of ingredients is quite strange and unfamiliar to us. Let’s go over some key ingredients to evaluate Work Juice’s safety and value. Ashwagandha is an ancient herb that works by calming the brain, lowering blood pressure and improve our immune system. Clinical studies have shown that the substance has successfully reduced anxiety levels and improved symptoms of ADHD. There are no known side effects when ashwagandha is taken orally and in the short-term. Meanwhile, Rhodiola Rosea is a traditional Chinese medicine that has been proven to reduce fatigue and exhaustion during stressful situations. Although Rhodiola Rosea does not increase energy levels, it counteracts lethargy and reduces anxiety. Ginkgo Biloba is the 2nd most used nootropic in the United States. People use it in belief that memory and mental alertness can improve from taking the substance. While some studies have pointed out ginkgo biloba’s benefits, others have found the substance to be futile. Ginkgo may be able to increase blood flow to the brain and act as an antioxidant. N-Acetyl-Cysteine is derived from the amino acid L-cysteine. It is mostly used to treat Tylenol poisoning and lung collapse. A few studies have shown that taking N-Acetyl-Cysteine by mouth may help to reduce depression symptoms. We assume that this is the substance used by Work Juice to enhance mood. Two members of our team here at BrainEnhancementAdvisor.org tested Work Juice during work hours for 2 weeks. They claimed that they did feel calmer and not as agitated when a problem came about. The effects did not reduce after 2 weeks, which was quite impressive. No side effects were noticed. You can purchase Work Juice on Amazon.com or on their official site. One bottle costs $44.95 on both platforms and contains 120 capsules. You are recommended to take 4 capsules a day in order to feel results, so one bottle is worth a month’s supply. Work Juice is an effective product that is quite affordable. However, since the ingredients used in the formula are quite uncommon and lack scientific backup, we recommend that you check with your physician before using the product.